Each 2-3 year learning cycle in the SOLA curriculum has an underlying theme that supports learners' developing consciousness and cognitive capacities. During the 9th-12th grade years, learners begin to develop a deeper awareness of the physical, emotional and intellectual changes happening within themselves, and the ability to recognize the inter-connectedness between humans, nature and the universe in new and profound ways. Through comparison and contrast, and eventual resolution, learners will long to practice and experiment with their newfound understandings and budding self awareness and identity in the ‘real world’. This is met with an expanded field of learning- internships, off-campus learning, and international group travels- which allow learners to further develop their powers of observation, their identity and place in participation, and the ability to recognize patterns within the dynamic flows of transformation and change. The powerful and emerging critical intelligence of the 15-18 year old first resonates with the underlying polarities and their worldly expressions that are woven through the curriculum for this 2-3 year learning cycle. As thinking capacity deepens, tension between opposites gives way to the recognition of processes that transform our world over time, and a budding desire to participate in these processes in a meaningful way. Comparative, systemic and process thinking – how one thing relates to the other, how parts work together in the context of the whole, how forms develop, and how substance is transformed – are integrated into themes during this two year learning cycle. Topics in English, mathematics, science, and history as well as the thematic blocks echo the developmentally appropriate gesture of the dramatic tension between opposites, and the eventual integration and resolution of this tension. 9-12 thematics include Anatomy & Physiology, Art & Music History, Revolution & Reform, Descriptive Geometry, Organic Chemistry, Environmental Science & Ecology, Astronomy & Physics, Comedy & Tragedy, Classical Histories, Philosophy & Ontological Studies, and more. Learners will also be given an opportunity to earn college credits through their participation in off-campus classes at AB Tech, and to practice and explore internships with local artisans and professionals in the Asheville region. more formal process of comparing and contrasting ideas found in subjects like English, Poetry, Ancient Civilizations, Physiology, Geometry. Classes begin each day at 9:00 am, and are dismissed at 3:00pm. Off-campus learning schedule varies. Thematic blocks are offered continually through the year, in 1.5-2 hour morning sessions. Topics shift every 2-6 weeks. Our international learning venues for grades 9-12 include Ireland, France, Costa Rica, Greece, and more. Through selecting a venue, planning, preparing, and fundraising for their trip, grades 9-12 students learn more about themselves as creators of their own class/community culture, and dive deeply into cultural identity as an element of their own humanness. These expeditionary learning experiences are guided by skilled mentors, teachers and expeditionary educators. Internships are held on Fridays, and occur off-site at local artist and professional venues. Internships are offered in trimesters, but can continue as long as student and teacher wish for them to. Academic focus classes are offered continually through the year, in 60 minute sessions, 2-4 times per week. Constructive and descriptive geometry offer an experience of form and function in the material world. Through the internationally recognized PeaceJam curriculum, students identify service projects in our own and the greater community, and learn to engage service in a deeper, meaningful way through their studies of Nobel Peace prize recipients. Enrichment and electives are offered each afternoon, in 60-90 minute sessions. Students may opt to deepen their experiences of these topics through the creation of a Friday internship. Theater & Performance: Students collaborate to create an end-of-year performance each year, with an option to perform, do set design, or help author or direct the project. During the course of the year, they may also offer brief presentations of artistic work, rhythmic or musical skills at festivals, events, parent & student gatherings. Animal Arts: Equine ground work, riding, grooming & care; farm animal care, feeding, communication & connection; basic animal physiology. 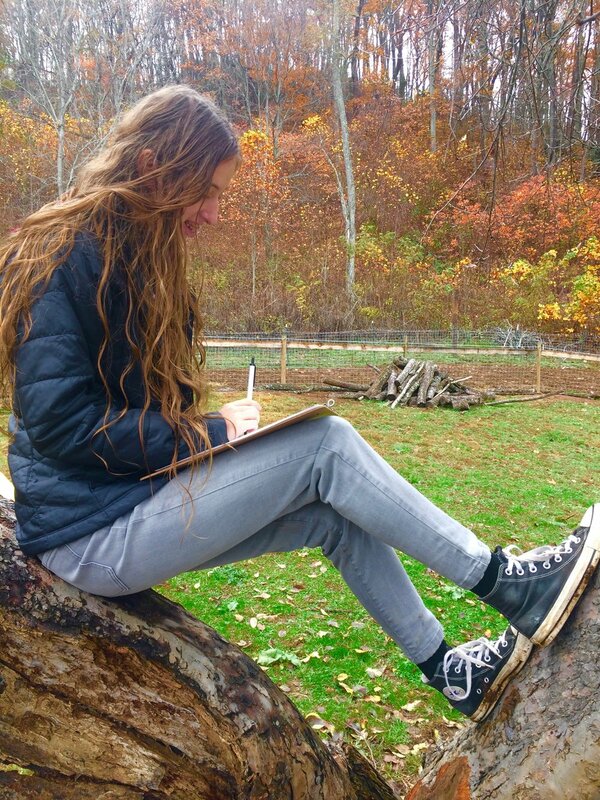 Land Arts: Students learn about garden, land, water and forest stewardship through regenerative practices and biodynamics. Media Wisdoms: Students are given a wise & appropriate context for understanding technology & media. Topics include etiquette, social media, advertising, games, email, keyboarding, computer & internet skills. Yearbook: Students work on design, content photography and layout of Seasons of Learning, our annal of the year's activities at School of Living Arts.